After Valiant Comics was bought out and became Acclaim Comics, very few of its new concepts received much attention ... except for Quantum and Woody, created by industry veterans Christopher Priest and Mark Bright. The tale of two mismatched adopted siblings who must make contact every twenty-four hours to keep their powers was an anarchic ride beloved by many readers. The recent relaunch of the title was one of Valiant Entertainment’s very few gaffes -- namely, it was perceived by fans that Valiant shouldn’t technically own Quantum and Woody and the rights should have returned to Priest and Bright. To their credit, Valiant ironed out the details immediately, allowing the original creators to put together their own upcoming mini-series while going ahead with the issues collected in Quantum and Woody Vol. 1: The World’s Worst Superhero Team. Consider this: since Valiant puts out only about a dozen books a month, roughly 20 to 25% of their material is comedy. They can get away with it thanks to the strong reception of both Archer and Armstrong and Quantum and Woody, who will cross over later this year in The Delinquents. James Asmus did as much research into the past of his characters as any other Valiant writer. Pretty much everything from the original series is back, from the personalities of the main characters to the presence of their pet goat. Only Quantum’s old love interest is gone, but that’s mostly because racial politics are slightly less important in this version of the title. Asmus even makes an effort to write like Priest, with large black semi-descriptive caption boxes serving as scene transitions. The original series is now up in its entirety on Comixology, and while I haven’t been able to read much of it yet, I can tell that Asmus is doing his best to match the tone of the original while modernizing the concept and going in his own direction. 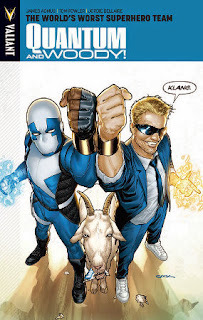 Most of The World’s Worst Superhero Team is dedicated to the origin of the main characters (which is why the title’s first zero issue tells the origin of Vincent Van Goat). It can feel a little decompressed at times, but it takes this long due to numerous flashbacks to the title characters’ childhoods. Eric (Quantum) Henderson and his father did their best to set Woody Van Chelton on the right track and it’s Dr. Henderson’s death which brings them back together. What really makes the book work is how the Eric and Woody each have their skills and imperfections. It would have been easy to make Eric absolutely perfect, but while he’s more intelligent than Woody, he’s also a failure at various jobs. Woody has been changed from a slacker to a grifter, and it’s a modification for the better, giving him lots of funny background stories and strong core traits. The accident which gives them their powers ends up tailoring those abilities to their personalities, granting Eric defensive shields and Woody energy blasts. The exact consequences of what will happen to them if they don’t “KLANG” their bracelets together (with the name taken from the sound effect it generates) are spelled out very quickly. It’s essentially The Odd Couple mixed with Captain Mar-Vell. Asmus also made a great move in creating one of the wackiest villainous groups in any comic book universe to go up against Quantum and Woody. Known as Edison’s Radical Acquisitions, they’re a secret society of misfit science experiments who slow down the rate of technology until humanity is ready for advancement. Their mission ties directly into the brothers’ origin story, and it turns out the real Thomas Edison was an unpleasant enough person to have plausibly come up with such a ruthless concept. I think Asmus tried to tie everything together a little too neatly by having the ERA also be involved with some of the supporting characters, leading to some clone confusion, but I’d rather have too much cohesion over less. While it hasn’t been stated outright, I’m fairly sure the ERA are part of the Sect coalition of villains in Archer and Armstrong; it wouldn’t surprise me if The Delinquents takes this route. Tom Fowler’s artwork matches the tone of the story nicely. It’s very expressive, and while some of the energy effects early-on tend to obscure the action, it’s clear that he just needed a few issues to get everything straightened out. I’m fairly certain that Jordie Bellaire is the colorist on 75% of the comics I read on a monthly basis, and her bright colors accentuate the mood, especially when she uses sepia tones to illustrate an ancient ERA filmstrip. Dave Lanphear, one of Valiant’s go-to letterers, had extra work to do for Quantum and Woody due to the frequent caption boxes, and the resulting captions have a great “title card” look to them. Also included in the trade are a series of brief web-comics that Valiant put up to promote the series. They break the fourth wall constantly and poke fun at some of the controversy around the title’s start. The award for “my second-favorite Valiant book” tends to flip-flop between X-O Manowar and Quantum and Woody depending on the arc. I can safely say that the series collected in Quantum and Woody Vol. 1: World's Worst Superhero Team is one of the most consistently funny comics on the shelf, and I applaud Valiant Entertainment for taking a risk in bringing it to fruition. Free Comic Book Day is this Saturday, and Valiant is putting out two books for it -- a preview of the upcoming Armor Hunters crossover and, to my delight, a Valiant Handbook. Make sure to check them out. This was already on my to-read list, but your review has got me anticipating it even more. I'm on a true Valiant binge at the moment and am currently reading the first volume of Archer & Armstrong and the fourth volume of X-O Manowar. I'm also trying to decide between Bloodshot, Shadowman, and Harbinger, though, truth be told, I'll probably end up reading all three. I can't remember ever being this excited about a publisher before (I was born in 1987, so I wasn't alive for the 80's-era Marvel and DC, but if I were, I'd imagine that I'd feel the way I feel about Valiant). Also, cheap plug: I've been trying to write a review of everything I read just to build up better writing habits. So far I've reviewed the first 3 volumes of X-O Manowar, among other things (http://www.popculturereport.tumblr.com). Anyway, you and CE both do great work, Doug. Keep it up. My mail order of a bunch of Valiant trades turned up the day this review was posted so of course the first one I pulled off the stack was Quantum & Woody. I've since read it again and it certainly clicked with me more on my second read through. Not only were the jokes funnier (maybe I was just in a better mood) but I felt that I got a better sense of the tone and style this book is going for compared to something like XO Manowar. While XO Manowar has been great in building a world for Aric to fit into and fight against, Q&W is of course mostly about the relationship between the two characters and how they deal with being together again after a troubled past. With this in mind, I was more easily taken for a fun ride without needing too many details about the world of the comic. That said, I didn't feel the powers of Quantum & Woody were explained all that well; on the other hand, Quantum & Woody seem to have very few ideas about this themselves. Overall, I'm having a fun time with this book and will be heading back for more with the next trade. Looking forward to your thoughts on Bloodshot, Harbinger (especially) and Eternal Warrior!